1.43. Digital technology will provide convenient ways for patients to access advice and care. For patients and staff the starting point is interoperability of data and systems, as set out in Chapter Five. Then, building on progress already made on digitising appointments and prescriptions, a digital NHS ‘front door’ through the NHS App will provide advice, check symptoms and connect people with healthcare professionals – including through telephone and video consultations. Patients will be able to access virtual services alongside face-to-face services via a computer or smart phone. We will continue to invest in the nhs.uk platform so that everyone can find helpful advice and information regarding their conditions. As technology advances, we will also trial the use of innovative devices such as smart inhalers for better patient care and remote monitoring of conditions. We will also continue to support the development of apps and online resources to support good mental health and enable recovery. 1.44. Under this Long Term Plan, digital-first primary care will become a new option for every patient improving fast access to convenient primary care. There are about 307 million patient consultations at GP surgeries each year. Some GPs are now offering their patients the choice of quick telephone or online consultations, saving time waiting and travelling. Over the next five years every patient in England will have a new right to choose this option – usually from their own practice or, if they prefer, from one of the new digital GP providers. In other walks of life, mobile phones and apps have already transformed services. New digital-first primary care is proving convenient and popular, and is bound to grow. There is also emerging experience that digital GP models can help expand the GP workforce participation rate by offering flexible opportunities to part-time GPs. The NHS will deliver on this new commitment through three approaches. First, we will create a new framework for digital suppliers to offer their platforms to primary care networks on standard NHS terms. Second, and in parallel, we will ensure that new ‘digital first’ practices are safe and create benefit to the whole NHS. This means reviewing current out-of-area arrangements and adjusting the GP payment formulae to ensure fair funding without inequitably favouring one type of GP provider over another. Third, we will review GP regulation and terms and conditions to better support the return to practice and increased participation rates by GPs wanting to work in this way. Figure 6: Public willingness to use video consultations with their own GP. Source: Castle-Clarke S. What will new technology mean for the NHS and its patients? Four big technological trends. The Health Foundation, the Institute for Fiscal Studies, The King’s Fund and the Nuffield Trust, 2018. 1.45. Outpatient services will be fundamentally redesigned. While GPs have been highly successful in constraining referral growth for new outpatients over the past two years (with referral growth flat), hospital outpatient visits have nearly doubled over the past decade from 54 to 94 million, at a cost of £8 billion a year. Figure 7: Outpatient appointments and attendances, England, 2007/08 to 2017/18. Source: NHS Digital. Hospital Outpatient Activity, 2017-18. October 2018. 1.46. Outpatients traditionally serve at least three purposes, and in each case there are opportunities for redesign. An outpatient appointment can provide: advice and diagnosis for a patient and their GP; follow-up review after a hospital procedure; and ongoing specialist input into a long-term condition. Technology means an outpatient appointment is often no longer the fastest or most accurate way of providing specialist advice on diagnosis or ongoing patient care. The Royal College of Physicians has rightly argued that outpatients needs a radical overhaul . Source: Royal College of Physicians. Outpatients: The future. Adding value through sustainability. 2018. 1.47. In some hospitals patients are already benefitting from the redesign of outpatient services. These include better support to GPs to avoid the need for a hospital referral, online booking systems, appointments closer to home, alternatives to traditional appointments where appropriate including digital appointments and avoiding patients having to travel to unnecessary appointments. This is better for patients, supports more productive use of consultant time and enables the capacity of outpatient clinics to be used more efficiently. Tower Hamlets CCG, working with City and Hackney and Newham CCGs, established e-Clinics to improve management of Chronic Kidney Disease and reduce End Stage Renal Disease. The new service supports timely provision of advice from the hospital specialist to the GP, to enable better management of the patient either in the community or with more specialist care where needed. A single pathway from primary to secondary care with rapid access to specialist advice provided by consultant led e-clinics have transformed the way the outpatient service is delivered. 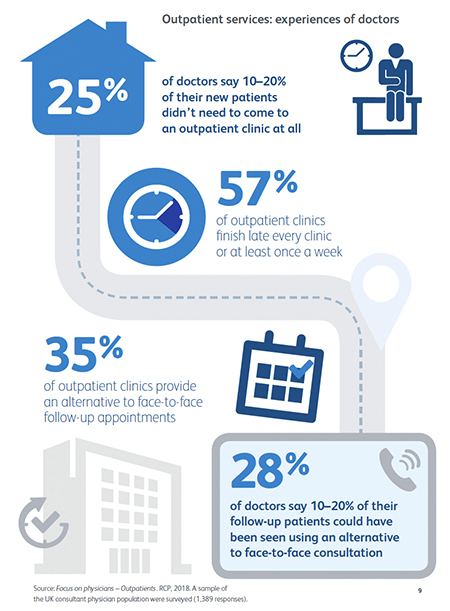 Since the e-Clinic began in December 2015, 50% of referrals are managed without the need for a hospital appointment. The average waiting time for a renal clinic appointment has fallen to five days, from 64 days in 2015. 1.48. In short, the traditional model of outpatients is outdated and unsustainable. We will therefore redesign services so that over the next five years patients will be able to avoid up to a third of face-to-face outpatient visits, removing the need for up to 30 million outpatient visits a year. This will save patients time and inconvenience, will free up significant medical and nursing time, will allow current outpatient teams to work differently, and will avoid spending an extra £1.1 billion a year on additional outpatient visits were current trends simply to continue. These resources will instead be used to invest in faster, modern diagnostics and other needed capacity. 1.49. It’s easy to be cynical about the achievability of these big technology-driven shifts in outpatient But there are now at least four reasons not to be. They are already happening in parts of the NHS, so this is clearly ‘the art of the possible’. There is strong patient ‘pull’ for these new ways of accessing services, freeing-up staff time for those people who can’t or prefer not to. The hardware to support ‘mobile health’ is already in most people’s pockets – in the form of their smart phone – and the connection software is increasingly available for the NHS to credential from third party providers. And the Long Term Plan provides dedicated funding to capitalise on these opportunities, as detailed in Chapter Five. 18. Royal College of Physicians (2018) Outpatients: The future – adding value through sustainability. Available from: https://www.rcplondon.ac.uk/projects/outputs/outpatients-future-adding-value-through-sustainability.